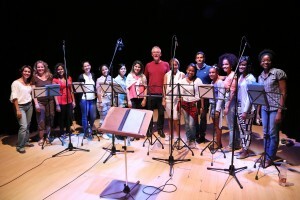 I was approached by Parma Recordings about participating in a musical project involving eight composers going to Cuba and working with Cuban musicians in having their works performed and recorded. I initially was disinclined but my guardian angel and spouse Daniel Shiplacoff convinced me to go for it. I was to work with Wilmia Verrier Quiñones and her women’s chorus, Ensemble Vocal Luna [pictured above]. They chose my ALARCÓN MADRIGALS, BOOK 3 for the project. Francisco X Alarcón and I are collaborators, and I have set many of his poems. The women sang it beautifully. Recording sessions went very well. Wilmia loved then “perfect correspondence between the poetry and the music”. So much so, that she offered to put on an all-Bourland concert in a year. I said yes. We spent the week with friends from Parma and the composers. A terrific week of touring within Old Havana and music. A long list of wonderful restaurants. (Neither of us got sick. Drink bottled water; only ice that comes from bottled water. Two of the twenty did get sick.) We never got to Anthony Bourdain’s recommendation, but will next time. We rode in modern yellow taxis, late 1950s reconstructed car taxis, and bici-taxis with Cubanos with thunder-thighs that drive you and your luggage around La Habana Vieja and its cobbled streets. The young Cubans I saw are fit, clean, beautiful with great taste in clothes and they all seem to pluck their eyebrows: boys and girls. It was very hot, so clothes were spare. (Look at the photo above to see the fabulous variation in their faces, bodies, skin hues. We heard one woman exclaim: “In Cuba we are not black or white––we are Cuban colors!” ‘Perfectly clean white’ seems to be the color of choice among handsome men. It is also the color of the Santeria religion, whose ceremony we bumped into one morning. We saw many near the Capitol in full regalia, all white, coming or going somewhere. International tourists are everywhere. Tourism is Cuba’s main economy. But the government run mega-hotels are tired and need major renovation. We stayed in only-recently-opened AirBnB rooms. The first place was modern and well put together. The second was a small flat on the 3rd floor, built for people who are a foot shorter than I am. Daniel threw out his back trying to shave in the mirror. I had to duck going down the stairs. And smoking is allowed everywhere. It’s CigarLand. You can legally bring back cigars and rum from Cuba into the US now (up to $400). There are a zillions scheisters in the streets trying to sell you “Cohibas” — Fidel’s favorite cigar. They are all fake. Only buy cigars in the government sanctioned places–or if you visit the tobacco fields or the factory. Havana has had to weather hurricanes for its long history. And like many other cities, there are many downtown building that cave in, they become abandoned, trees and plants start growing inside. And they are still that way. The capitol building is newly remodeled, and all the streets around it are getting new plumbling, and gentrification is not far behind. We had lunch looking down on the newly reopened American Embassy. It all became very real. We had lots of photos taken in front and one of the senior went up to the gate asking to have her picture taken there and one of the two guards came to her and insisted she go back across the street. 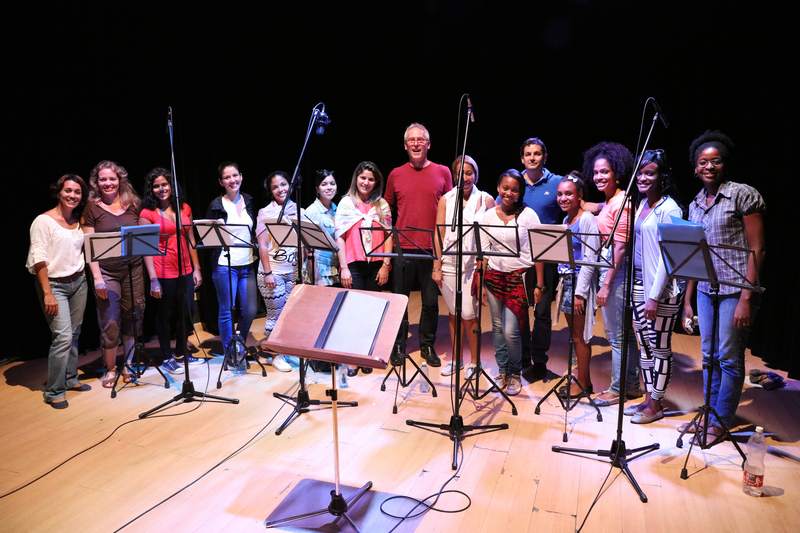 We went to a concert of the 28th Annual Havana Contemporary Music Festival. Throughout, we had to look at the alter, and the only thing on the wall was an enormous painting of Joseph with the baby Jesus on his shoulder. I kept staring at it and realized it was Fidel. St Fidel with hat or cigar, and his shoulder was bare. But it WAS Fidel. There are many stories to tell, but this one was the one that stood out: I was chatting one morning with our flat managers, two sisters and a daughter, in Spanish (YES they speak REALLY quickly), in comes a slender Bob Marley cousin type neighbor who teaches Spanish and Dance in a local arts school. We strike up an animated conversation. He is completely generous about having us come to his studio to see his dance troupe, and offered to teach us fun Cuban dances. I told him about my upcoming ballet in Mazatlán and gee, wouldn’t it be great if you could fly out to hear it. He turned and translated it all the three women and they all burst out in hysterical laughter. Lesson learned: it is very difficult to get out of Cuba unless you have legitimate work that the Cuban government approves of. The notion of going to Mexico is also out of the question because it is near the US and they could seek asylum in the US and get it and never come back. Claude Debussy allegedly said: Music is a jealous mistress. I have found that I cannot be a photographer while I’m in the middle of composing music. So I am thrilled that Daniel has rekindled his love of photography and has chronicled our voyage in photos and is editing them now. Old Havana is a photographer’s dream. We were completely cut off from the world. No internet or cell phone connection. We laughed and realized that something horrible would happen in the world and we wouldn’t know about it until we got back. The 11/13 Paris terrorist attack happened and we didn’t find out about it till the 15th, in an airport in Panama City. The lack of internet has an interesting effect on the city: people are out on the streets and in parks talking, visiting. Very few have their heads buried in their phones like the rest of the world. I look forward to a day when the world can put away their devices and get to know each other anew and in person.